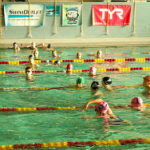 Swimming is rarely thought of as a “team sport”. When people think about swimming, they usually conjure up images of a lone swimmer going up and down the pool while staring at a black line. However, what makes swimming such a powerful sport is the interaction you have with your teammates on a daily basis at every practice and meet. Forming a strong bond and building great chemistry with your teammates will carry you through hard workouts, long meets and high pressure situations. When it comes to meets, nothing is more exciting and pressure-packed than swimming on relays. A great relay has the power to inspire an entire team, ignite the crowd and create one of the most exciting atmospheres in competitive sports. With all of this excitement and pressure, it is extremely important that all swimmers have rehearsed hundreds of relay exchanges with their relay team before the big show. Fitter and Faster asked some of our Olympians what they think about, when standing on the blocks and racing in some of the greatest relays of all time. Olympians Peter Vanderkaay, Lauren Perdue, Davis Tarwater and Alyssa Anderson share some great tips for you to focus on the next time you are practice relay starts. Q: What do you think about on the blocks when your teammate is swimming in? Peter: At this moment, I’m always carefully timing the speed of the incoming swimmer. It is important to recognize whether he is speeding up or slowing down to avoid an early or late exchange. Lauren: I focus on the swimmer’s rhythm as they move down the pool and when they are about 15 meters from the finish, I frame the swimmer with my hands forming two “L’s” out on front of me. When the swimmer enters the flags I keep my hands in rhythm with their strokes and when the swimmer is about to reach the “T” on the bottom of the pool I begin my wind up and explode off of the block as they touch the wall. Davis: It is important to be in sync with rhythm of the athlete in the water. Your responsibility as a relay teammate is to finish well and consistently. 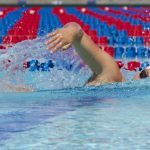 Most false starts are actually the fault of the athlete in the water finishing too softly. Evaluating rhythm will help you understand better when your teammate will hit the wall. Q: What tip(s) would you give swimmers who are trying to improve their relay starts? Peter: The best way to improve your start is by practicing with teammates. Make sure you are comfortable with your stance wind-up. Practicing starts at all different speeds will help your awareness of timing. Alyssa: Practice, practice, practice! We would practice just a few relay starts after each practice, so it became a habit. Davis: Chemistry with your teammates is the most important thing. But to improve your timing, start by taking relay starts in a track start position. Once you can comfortably establish timing, only then should you move on to a full step-up exchange with both feet back. Lauren: – A great relay start is all about perfecting your timing. A tip to improve timing is to place your hands out in front of you in an “L” shape to frame the incoming swimmer. This helps me to time their strokes and get a feel for the rhythm of their body before I start my wind up. Another more advanced tip is to start by standing on the back end of the block with both feet shoulder width apart. As the swimmer in the water approaches the finish, set up your “L” frame and begin your wind up when they reach the “T” on the bottom of the pool. As you begin your wind up, move one foot forward with the other foot quickly following. As your second foot reaches the edge, use that momentum and to explode off the block. Q: What is your favorite or most memorable relay? Peter: My favorite relay was the 2004 Olympic gold medal winning 4×200 free relay in Athens. We narrowly out-touched the Australians who were the favorites to win. Lauren: My most memorable relay was competing on the 4×200 Freestyle Relay at the 2012 London Olympics. 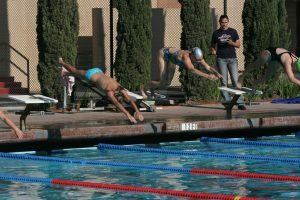 Although I was nervous as the lead-off swimmer, I used that adrenaline to give our relay a strong lead out in front of the field. There is no greater feeling than competing for your country. Davis: My most memorable relay was when Peter Vanderkaay, myself, Andrew Hurd, and Dan Ketchum won NCAAs in the 800 free relay in 2004. Alyssa: The 4×200 freestyle relay. Both at the Olympics and NCAAs! Perfecting your ability to time when the incoming swimmer crosses the “T”, with taking your first step in the relay start. Using different speeds when practicing your wind up and take off. This will help you build into a full speed relay start. 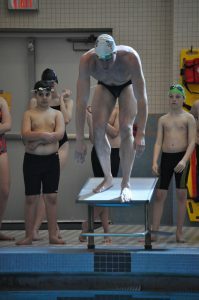 Begin in the track position until you feel comfortable, then progress to the full step up relay start position. The key to a great relay exchange is to practice with the teammates with whom you will be on a relay and repeating what you have practiced in those high-pressure situations. Have fun with the practice, build chemistry with your teammates and take notes from the advice of our Olympians Peter, Davis, Lauren and Alyssa. Soon, you will not only have a great relay start, but also a fantastic group of friends with whom to race.